From the fairground organ whimsy actualized in the opening bars of “Blowing Up My Mind” immediately supported with an uptempo female vocal assault in triplicate, to the non-manipulated, sample ready horn line delivered on-beat at the start of “Give It Up”. The Exciters, a dynamic R&B quartet consisting of lead singer Brenda Reid her producer, writer, and husband Herb Rooney, plus vocalists Carolyn Johnson and Lillian Walker, epitomized the inerrant union of assertive female voices and energetic rhythm. “Caviar and Chitlins”, originally released by RCA in 1969, carries a somewhat inspirational blueprint of what the Daptone label has become. The Exciters rose to prominence in 1962, when their hit single “Tell Him” rose to #4 on the U.S. pop chart. 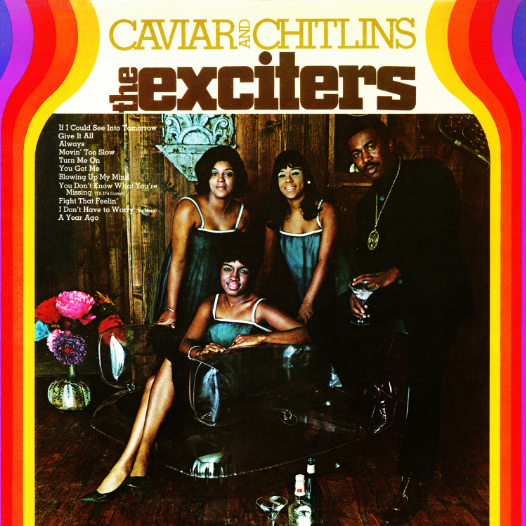 According to The History of Rock, Exciters were one of the first vocally aggressive female groups and gave inspiration to acts like the Ronettes and The Shangri-Las. The Exciters were originally a quartet of seventeen year olds who were high school classmates in Queens, New York who called themselves the Masterettes. In the early 60s, while doing local shows with “brother” group the Masters, they met bassman Herb Rooney. He found the harmonies solid and felt Reid’s powerful voice made the group exciting. In 1973 Rooney would go on to produce and write one of hip-hop’s most sampled records ever, “Synthetic Substitution” by Melvin Bliss.